Easily manage and pay your utility bills with our online service. Keep up to date on events that are happening in Ladd. Looking for a form or application? Find it here. The Ladd Recreation Board will sponsor an Easter Egg Hunt for children and grandchildren of Ladd residents ages preschool thru 4th grade at 10:00 am on Saturday, April 20, 2019, in Kennedy Park – 900 East Locust Street. Children will have breakfast with the Easter Bunny, KP Photography will take photos with the Bunny for $5, and weather permitting, Furry Friends will be there with animals. Bring your own basket for the egg hunt. In case of inclement weather, activities will take place inside the Ladd Moose Lodge. Prior to the Egg Hunt, a Story Hour will be held in the Ladd Public Library at 9:00 am. Father Ronald Margherio will celebrate Easter Sunday Mass at 8:30am on April 21, 2019, in Ladd’s Community Center. Everyone is welcome to attend. Spring brush collection will be held on Monday, May 20th, weather permitting. Crews will pick up tree and shrub trimmings that are from 3’- 8’ in length and up to 6” in diameter. Piles should not exceed 4’ X 8’ in size. Larger branches and items such as stumps, roots and professional tree trimmings will not be collected. Bundles should not be tied or bound and are to be stacked with the cut end toward the street. Crews will start working early in the morning and make one pass only through the area. For more information, contact the Village Garage @ (815) 894-2806. 2019 Golf Cart stickers are now available in the Village Clerk’s office for $25. All golf carts are required to have a current sticker which is valid from April 1st – March 31st. More information on golf cart use in the Village can be found on the Residents tab. The Ladd Farmer’s Market is returning to War Memorial Park in 2019! The Market will open on Monday, June 10th from 4:00 pm to 6:30 pm and will continue each Monday thru September (if produce is available). There is no participation fee, we would love to have you join us so we can make this our biggest and best year! If you have any questions or would like to participate, call Molly at (815) 894-2619 or (815) 541-8116 after 6:00 pm. 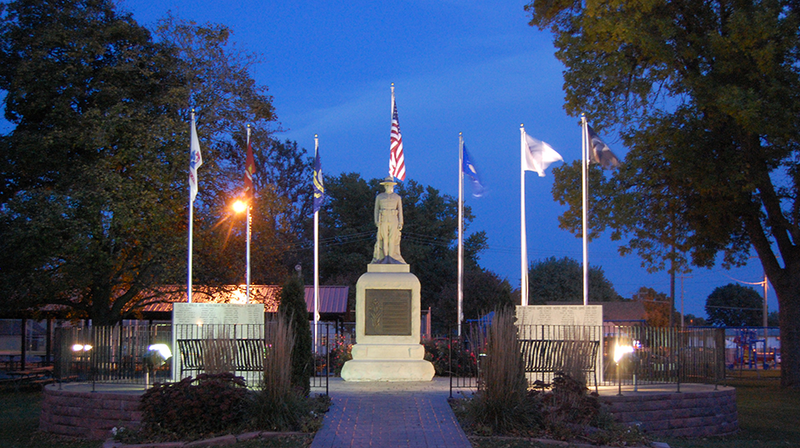 At the 11th hour on the 11th day of each month, Taps will be played over our Main Street speakers as a reminder to all citizens of the sacrifices that our servicemen and servicewomen have made for our freedom. Village dog tags are required for all dogs within the Village limits. Tags are $2 per dog each year and are valid January 1st through December 31st. 2019 tags are now available in the Clerk’s office. This tag is in addition to the Bureau County rabies tag. Reminder: dogs are not allowed to run at-large in the Village. Please be responsible owner and clean up after your pet. Story Time will be held at the Ladd Public Library each Tuesday from 10:30 am – 11:15 am. Cheri Linnig leads the program which consists of stories, a craft, and a snack. Preschool children ages 2-5 who are accompanied by an adult are welcome to attend. 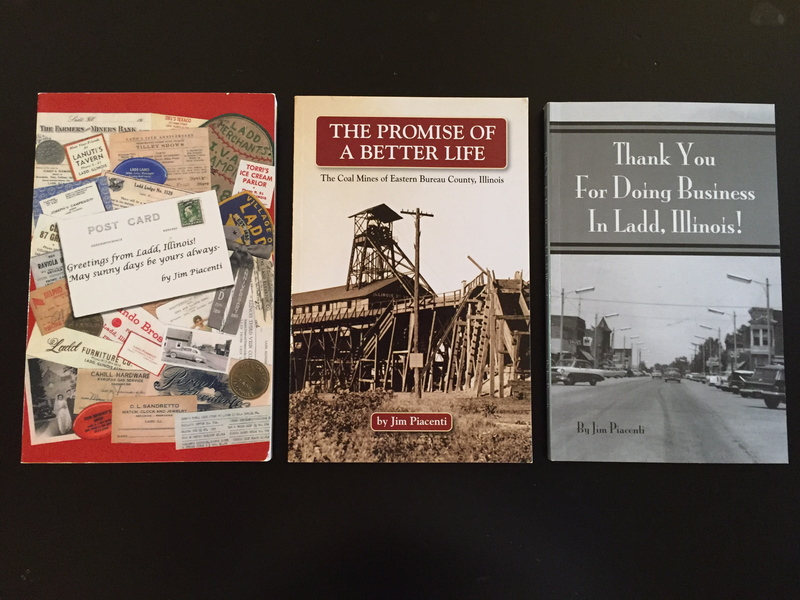 Ladd resident Jim Piacenti’s three books are available for purchase in the Village Clerk’s office or by contacting him @ (815) 894-2840. Greetings From Ladd, Illinois! ($20) recounts Ladd’s early history. The Promise of A Better Life ($22) references the coal mines of eastern Bureau County. Thank You For Doing Business In Ladd, Illinois! 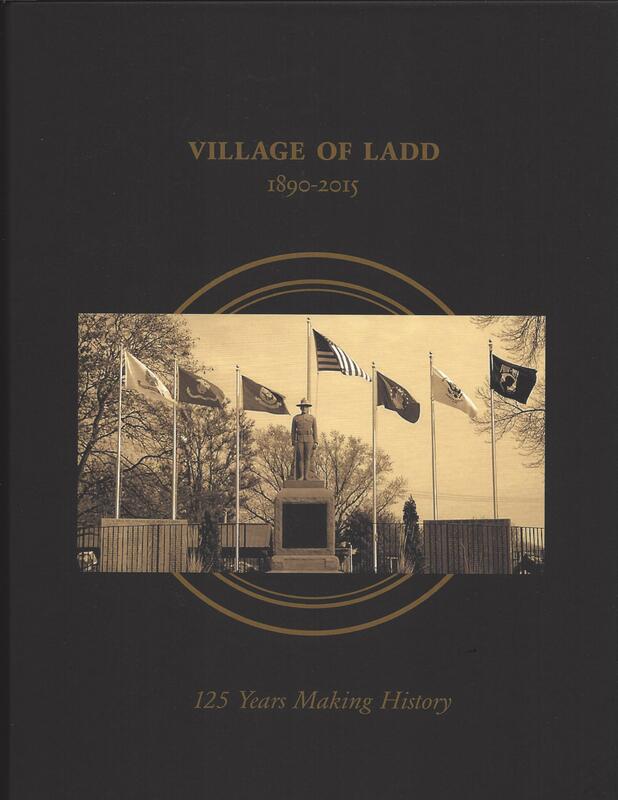 ($23) includes information on over 400 Ladd businesses from 1888-2015. Also available is Ladd’s 125th Anniversary Commemorative Book ($35) from the Village Clerk’s Office. With the busy holiday season right around the corner, let Schwan’s help out and give back to the Ladd Community Education & Enrichment Foundation (LCEEF) at the same time. Order from Schwan’s between November 1 and March 16 either online or by phone and Schwan’s will donate a percentage of your order to LCEEF. With over 300 delicious foods that go from freezer to table in minutes and personal delivery to your door, a quality meal is always within reach. Anyone, anywhere, can support LCEEF by placing their Schwan’s orders using either of the two methods: To order online, visit schwans-cares.com/c/43325, click “Shop Now” and start shopping! To order by phone, call 855-870-7208 and provide campaign ID 43325. 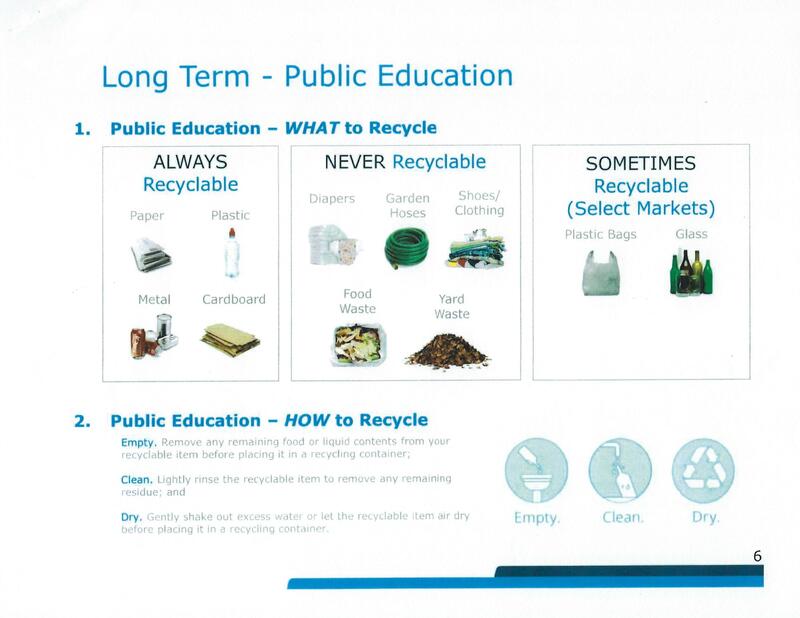 Republic Municipal Services Manager Jim Pozzi recently addressed the Ladd Village Board on the importance of educating residents on the proper way to recycle. 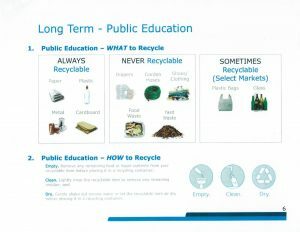 Please refer to the information below on WHAT and HOW to recycle. Your cooperation will be appreciated. The Village of Ladd is in the process of implementing a CMOM (Capacity, Management, Operations, and Maintenance) Plan for the Sanitary Sewer Collection System. In order to improve the ability to identify where basement backups and overflows occur, a system of record keeping will be implemented. For each complaint or notification received by the Village concerning a sanitary sewer overflow or a basement backup with the potential of being caused by issues with the Village’s collection system, a report will be generated. A form has been created for the purpose of keeping these records. Residents are encouraged to print, complete and submit the form to the Village Clerk’s office when they experience a sewer backup event. Forms are also available in the Village Clerk’s office. For more information, contact Superintendent Doug Englehaupt @ (815) 894-2806. The Village Clerk’s Office and Public Works Department will be closed for the Good Friday observance. Trash and recycling will be collected on the regular Friday schedule. De-stress and re-focus, use our supplies or bring your own.